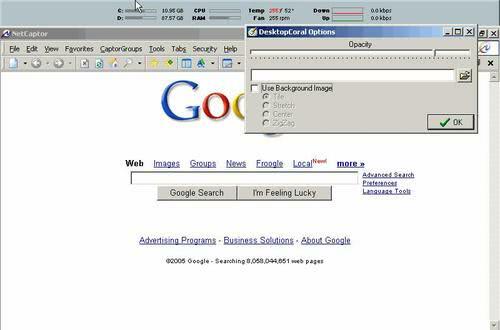 Have you ever asked yourself if it is possible to add another horizontal or vertical barrier to the screen in Windows? With another I mean that the taskbar is already something that is always visible unless you start a full screen application. It might be useful to create another area on the screen that is a no-go area for windows of all kind. Could be useful for instance if you want to display widgets in that area, information, to-do lists or anything else that makes sense to be always on top of the screen (unless a full screen application is run that is. Who would want to see a toolbar at all times while playing games for instance). Mouser from Donation Coder created the application Desktop Coral [via Cybernet News] which can reserve part of the screen so that no other window can place itself over that area. Everything gets pushed away from that area once the bar gets docked to the screen and only information that are displayed on the desktop remain. Even shortcuts are moved from the area. As I said the main use is for widgets or other kind of information that are displayed right on the desktop without windows. Applications that are started in full screen mode are still displayed in that mode, Desktop Coral is not interfering with them at all. It would be awesome if it would be possible to drop another window or application in the area that is secured by Desktop Coral. This would increase the possibilities quite a bit. What the program does basically is to reserve part of the screen to display application windows or other information there whenever you work on the system. This can be a news ticker, RSS feed reader, messaging software, hardware monitoring information or anything else you can think of.